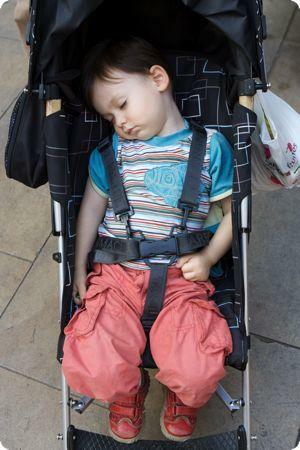 Weighty Matters: Are strollers contributing to childhood obesity? Are strollers contributing to childhood obesity? Last week I was filmed by CTV for a piece on a new study. It aired a few nights ago. The piece was exploring a new "study" that is being reported as illuminating a link between stroller time in 1-5 year olds and childhood obesity. Never you mind that the study failed to include an objective measurement of activity in these kids to determine actual levels of physical activity, never you mind that we don't have data on stroller use in the years before the rise of childhood obesity, never you mind that the calories burned even in active play for 1-5 year olds aren't much to write home about, never you mind that studies on childhood obesity clearly suggest it's not a problem of inactivity, and that in fact obesity leads to inactivity, not inactivity to obesity - none of those things matter because hey, childhood obesity's always news. I know, we'd all dearly love to blame childhood obesity on kids moving less, but at best that's a minor player, and stroller use in 1-5 year olds wouldn't likely make the top 100 chart of cause contributors. "When adjusted for age, birth weight, nutritional risk, maternal BMI, and maternal PA, there was no association between stroller use and zBMI (p=0.50) or z-WC (p=0.23)." Meaning that the study didn't in fact suggest or infer stroller time as causal for obesity. There are plenty of places to point fingers in regard to childhood obesity. What a shame to waste good airtime on something that anyone who actually took the time to read the study knows doesn't in fact matter. Captain America runs on Dunkin'? CIHI's take on their report. RDs! Want to work with us? FT job opening. MyPlate - America's new, irrelevant "food icon"
Shouldn't Health Check at least check calories? The City of Toronto pushes Coca-Cola on children.